To be able to prevent a jackknife from occurring, you must know every situation where the accident may happen. Jackknifing is a type of trucking accident that happens when a truck skids, causing the trailer to spin and collide with the cab. The accident often causes serious injuries, not only to the truck driver but also to the other drivers on the road, as the driver loses control of the vehicle. To understand jackknifing and to prevent it ever to happening to you, here are a few tips to keep in mind. Jackknifing is caused by a skidding truck, usually when the driver is accelerating too much as they are taking a turn. The wheels don’t gain enough traction to keep the cab and trailer aligned, and the two parts fold in on themselves at the point of separation. A jackknife can happen during slight curves, wet or slippery road conditions, or in the event of equipment malfunction. A trailer full of a heavy load is unlikely to jackknife, as the weight helps to keep it aligned in place behind the cab. However, if you are driving an empty trailer or one with a light load should be even more cautious than usual. Since the brakes are designed to stop a full load, the brakes are too powerful for a trailer that is underweight. When you try to brake, the wheels could lock up, causing the trailer to skid. 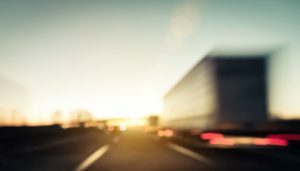 Slamming on the brakes in a truck can cause a wide variety of accidents, including jackknifing. To avoid any accidents, always remember to drive a safe distance behind other vehicles to give yourself extra time to react. When driving on slippery roads or driving downhill, spread your braking over the longest possible distance and reduce your speed gradually. When approaching a curve, you should apply the brakes while your truck is still straight and slow down even more than you may think is necessary, and release the brakes as you turn. Downhill turns are prone to jackknifing, so be sure to slow down substantially or even stop completely before attempting to turn. To prevent jackknifing from happening, start with proper maintenance on your truck. Uneven brakes, worn out tired and faulty suspension components only add to the risk of you losing control of the truck. This entry was posted on Thursday, November 16th, 2017 at 7:58 pm	and is filed under Trucking Safety. You can follow any responses to this entry through the RSS 2.0 feed. Both comments and pings are currently closed.